Although attendees are able to see your “visual aids” for the event, that doesn’t mean you have to be one of them. It’s rare for an hour long presentation to only show the speaker’s webcam. 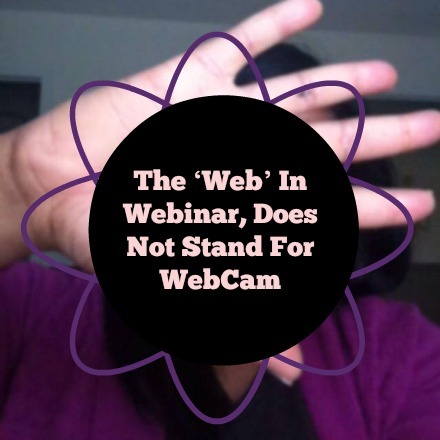 There is no webinar rule that says: You Must Be On Camera In Order To Host A Webinar. And no, I don’t mean you have your virtual assistant come on camera for you. In fact, webinars don’t require a camera at all. Your participants have come because they are interested in what you have to offer. Yes, it’s a chance to get to know you live and in the flesh. However, if you’re a bit shy to get in front of the camera, that shouldn’t stop you from hosting your own webinars. I’d like for you to take a quick second and think about the last webinar you attended. Including webinar replays, how many webinars have you seen where the host was on camera? – A PowerPoint presentation shared during your webinar. Of course, it should be an interesting and engaging PowerPoint and not the old fashioned style that’s really just your notes on screen. 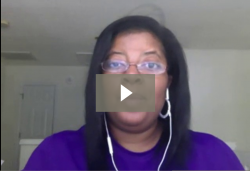 – If you’re doing a training webinar, attendees want to see what you’re doing. Your webcam video in the corner may be a distraction. Getting rid of it leaves more room to show your screen. Let your audience see what you are seeing as you bring them along, step by step. – Use a picture of yourself during the presentation as opposed to coming on screen. Who says you have to be on camera during your webinar. You can choose to say a quick hello on camera or not come on at all. If you’re providing great content during your presentation your audience won’t even realize you weren’t on camera. Don’t let the fear of being in front of the camera get in the way of hosting a webinar.